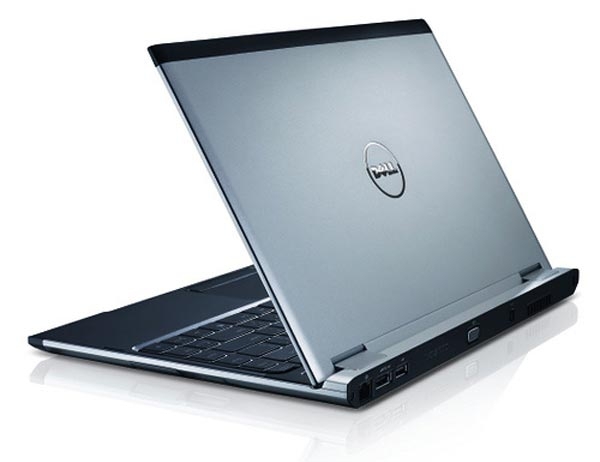 When I hear the words "Dell Vostro", I think big, bulky, corporate laptops devoid of anything resembling nice design. A Dell Vostro I ordered in 2008 bore that out; it was cheap-feeling, heavy, and ugly. When I saw the Vostro V13, my jaw dropped: it had an Adamo-like design, and even more surprising, a Vostro-like price. This is a very compelling product that's worth a serious look by anyone seeking a thin and light general productivity laptop. Above is my unboxing and first impressions video of the Vostro V13, a shockingly thin (0.65 inches) and light (3.5 pounds) laptop from Dell. This particular model I'm looking at features an Intel Core 2 Duo SU7300 CPU at 1.3 Ghz, Windows 7 Home Premium (32-bit), 2 GB of RAM, a 320 GB 7200 RPM hard drive, 802.11n WiFi, a 1.3 megapixel Web cam, a 13.3 inch LED-backlit display (1366 x 768), gigabit Ethernet, a VGA-out port, a USB port and a combo USB/eSATA port. It also has a 34mm ExpressCard slot, a microphone jack, a headphone jack, and a 5 in 1 memory card reader. It has no optical drive. The V13 uses the Intel GS45 chipset, and the Intel GMA4500 GPU. I was intrigued by how thin the V13 was, so I undid the many screws and cracked open the case - and the above video shows what was underneath. Watch for my follow-up review video - it's coming soon! Jason Dunn owns and operates Thoughts Media Inc., a company dedicated to creating the best in online communities. He enjoys photography, mobile devices, blogging, digital media content creation/editing, and pretty much all technology. He lives in Calgary, Alberta, Canada with his lovely wife, and his sometimes obedient dog. He wonders if he'll live to the day when laptop battery live is measured in days rather than hours.